September’s NICU family feature is written by a woman that I met through our infant loss support group. It’s hard to believe that just over a year ago, we hadn’t even met and this last year we have been through so much together. We feel so blessed to have met Keith and Claire, and are honored that they are sharing their story here. Isaac is their baby born after they experienced multiple losses, so he is a true miracle baby. My name is Claire Matejka. Keith and I had been married six years before we finally decided to start a family. In February 2009, our first pregnancy ended in a miscarriage at just eight weeks. It was caused by a uterine abnormality. After surgery to “repair” my uterus, we spontaneously conceived twins in September of that same year. We could not be happier and really thought that even though twins were higher risk, everything would be fine. The entire pregnancy was a rollercoaster and ended February 17, 2010 at 22 weeks 6 days with the stillbirths of James Keith and Sophia Jewell. At their birth I told Keith that I could never do it again: my heart was broken. However, just a few months later, we decided they would want us to try again and we conceived Isaac in July 2010. The entire pregnancy was a nail-biting experience, but we felt we were well-prepared for it. I had a transabdominal cerclage placed at 10 weeks gestation. The doctors thought that it would help me carry the baby to full term. On November 1 (at 16 weeks), I was preventatively put on what the doctors called “couch potato” rest and began P17 injections (progesterone shots given to women with risk for preterm labor). Then, on January 5, 2011 (at 25 weeks), I went into preterm labor and I went on hospital bed rest. While in the hospital we had several visits from NICU staff at our request to discuss the baby’s outlook. At first it was grim, but as the weeks went on, there became more and more hope. When we reached 27 weeks, the NICU nurse assured us that 27 weekers do amazing in the NICU and that we should breathe a little easier. By 31 weeks, I had had over a week of no scares and I was sent home to continue my bed rest. At 33 weeks and 1 day, I went into preterm labor again and this time the doctors could not stop it. Isaac Thomas was delivered via c-section at 2:17am on March 1, 2011. He weighed 4 lb 6.5 oz and was 17 inches long. One third of his placenta had already detached and meconium was present at birth so he was not stimulated to breathe until they were sure his air passages were clear. 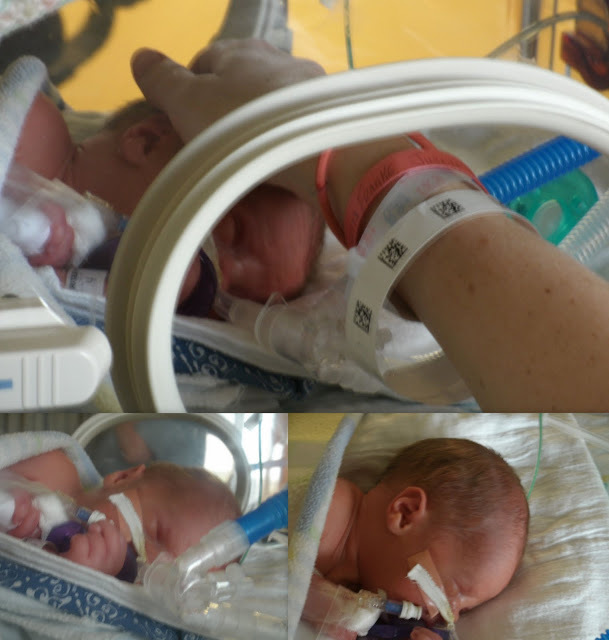 He used only a few minutes of oxygen and was on room air before he even arrived in the NICU. Going to the NICU is often the last thing on an expectant mother and father’s agenda. For us however, we were not only anticipating it, we were expecting it. I was thankful to have read The Premature Baby Book (a gift from friend and Mikayla and Chase’s mommy, Melissa Terrill, while I was on hospital bed rest). The book, combined with the information from frequent visits from NICU nurses, prepared us for what we would see. We also visited the unit before Isaac was born, so we were not surprised when we peered into an isolette for the first time to see Isaac. Nothing can really prepare you for seeing your helpless little baby in the NICU, but it can at least educate you on what is happening and make it easier for you to ask questions and communicate with doctors and nurses. Isaac was what they classified as a feeder/grower. He was very healthy from the get-go. Essentially, he needed to get bigger and stronger before he could go home. That does not mean there were not a few anxious moments though. Preemies often have what they call “spells.” They just forget to breath!?! Reading about them in a book and having it happen to your baby are very different experiences. Every time we went in to see him, we would ask about his progress and weight and a few times we were told about the spells. It is a very scary event for a parent and you can’t help but wonder what would happen to him at home if that happened. There were several criteria for being discharged from the NICU and being spell free for 5 days was one of them. The day before Isaac’s discharge he had a spell, but it self-resolved, meaning he stopped breathing, but then began again on his own without the stimulation of the nurses. This did not count against the criteria of 5 days spell free before discharge. As he seemed to get closer to discharge, a new anxiety consumed me…what if he wasn’t ready? What if they sent him home and he had a spell and then he… There again, is nothing that can prepare you for bringing your preemie home, not a book or a convincing nurse or doctor. Nothing. Feedings were stressful. I tried nursing, but he was often too tired and required all or part of his feedings by gavage tube. Feeding your baby through a tube is a heart-breaking experience and it was very difficult for Keith and me at first. Eventually, we became accustomed to attaching the syringe, completing the feeding and then clearing the tube and closing it afterwards. We know that we were still bonding, just not the kind of bonding we thought we would be doing with our newborn. Each feeding would begin with us taking his temperature under his arm and changing his diaper. Feedings seemed to take a long time by bottle. It would just wear him out and he was often sleeping by end of it. By tube it was slow too because you never wanted to go too fast and upset his stomach. We would expel a few cc’s and then wait a few minutes before giving him more. We wanted him to eat as much as possible. He had dropped weight within the first week to only 4 pounds. Burping a preemie is also a unique experience. It was awkward and unnatural. We would sit him on out lap and lean him forward so his neck cradled between our thumb and first finger. Then pat him on the back or rub up on his back in a pretty forceful way which just seemed too aggressive for his little frame. I would have objected to this but he really seemed to enjoy it! We learned to change our first diapers and dress him through the portals of the isolette. He was in an isolette for at least the first ten days while he was under the bili lights to reduce his jaundice. It is so hard when all you want to do is hold him and the only time we could take him out was for feedings. When we did take him out, he was dressed in a onesie and sleeper that were often enormous on him, even through they were newborn size. He was then wrapped in a receiving blanket like a little burrito. Once his jaundice was resolved, he stayed in the isolette until he learned to regulate his own body temperature. They slowly reduced the temperature of the isolette until it was at room temperature and then he was moved to a crib. The crib was pretty much the same type that full-term babies use in the nursery. It was amazing to walk in and be able to see him and touch him and pick him up when ever we wanted to. Finally. We wanted to share him with the world. He was allowed to have four people by his bed side at any time. One had to be a parent. Each visitor would have to enter the unit through a secure door, wash hands with soap and water and then use alcohol based hand sanitizer. I will never forget the distinct smell of the brand they use. From there, we all would stop at the nurses station and have to vow that we were not sick, had not been around anyone sick, etc. Then you would get a color coded sticker to wear for the day to let the NICU staff know you were “cleared.” We had a few family and friends come to visit him but it was often scary for them. We would try to prepare them, and often be able to show them pictures of him ahead of time, but even so it was hard for people to see him with all the monitors on him. It may have only been a 17 day stay in the NICU, but it was 17 days too long. It was exhausting. I would get up in the morning to be there for his 9:30 feeding and stay for a few hours. Then I would go home and try to rest since I was, after all, recovering from a c-section. Then Keith and I would go back every night for his 6:30 feeding and stay another couple of hours. All you really want is to stay there the whole time, but he really needed to sleep and grow and not have people man-handling him unnecessarily. It was really an emotional rollercoaster. We are so grateful for the wonderful care he received, but we couldn’t wait to get him home. July’s NICU family is another amazing story. I was connected through Meghan when we did our news story with Channel 3000 for Now I Lay Me Down To Sleep. Meghan and Brian told their story the week before for the same channel. Their story started out very much like ours, with their daughter being born just under 25 weeks, but thankfully their daughter Nora survived. Nora’s story shows the amazing things that can be done in medicine today. Even though Nora spent five months in the NICU, she is a happy healthy two year old today. Thank you Meghan for sharing your story. I hope that with each story we can raise more awareness of just how long and difficult the journey with a preemie in the NICU can be. 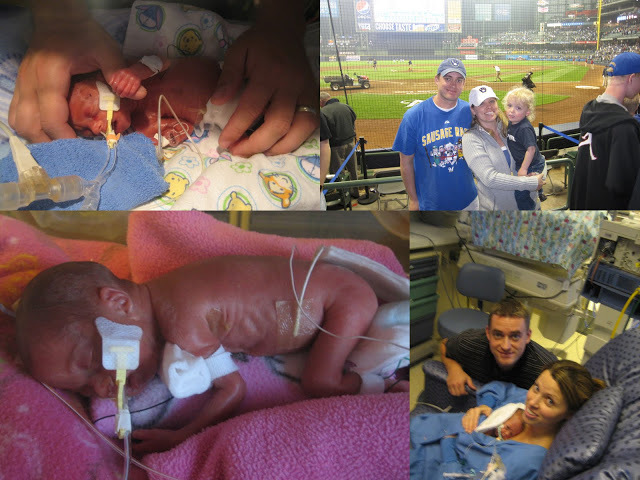 My name is Meghan Visger and I know what it is like to have a micro-preemie in the NICU. My husband, Brian, and I had been married for two years. We are both teachers just north of Madison. In the spring of 2008, Brian and I learned that we were going to have our first child in the beginning of January, 2009. We were both elated. In August we found out that it was going to be a girl. By September I was starting to show and the baby was even starting to kick a little. I was having the perfect pregnancy. There weren’t any complications. I wasn’t even getting sick. We were so excited. In the middle of the night on September 20th I started having what I thought were symptoms of a bladder infection so we stopped at the hospital in Portage to get checked out and get some antibiotics. They told us that there were some more significant issues going on and that we should drive down to St. Mary’s where we would hopefully get everything back to normal. When we got there, we were still under the impression that they’d be able to fix whatever was going on and the pregnancy would continue like normal. Within an hour we learned that that wasn’t going to happen. When the doctor showed us the images that showed that the amniotic fluid was gone our hearts sank. He confirmed our fears when he explained that I had gone in to labor the previous night and the baby was not only going to be born early, but was going to be born very soon. I was only 24 weeks and 4 days along. They moved us in to a birthing suite and had Dr. Wiringa, one of the neonatologists at St. Mary’s, come to talk to us. She has an excellent bedside manner and has an amazing ability to put even the worst news gently, but her gentle words fell on us like bombs. She explained that our baby had about a fifty percent chance of survival, and that if she did survive, about a two out of three chance of having some developmental disabilities. We couldn’t believe what was happening. We couldn’t cry…we felt numb. She told us that she had delivered a lot of preterm babies and that she would have a good sense if our daughter had a chance of survival when she came out. We told her that if she had any chance that we wanted them to do as much as they could. Right then I said I had to go to the bathroom, and that’s when it all happened. I noticed I could see the umbilical cord. I called for help and the next thing I knew they were whisking me to the O.R. on a hospital bed to do an emergency c-section. I started sobbing and screaming “NO” and “WHY?”. Brian ran alongside me feeling as scared and helpless as he’s ever felt in his whole life. When we got to the doors of the O.R. they said Brian couldn’t go any farther and he stood there as they all hurried around the corner and out of sight. After a short while one of the residents found Brian in the birthing room and asked him if he wanted to see his daughter. He thought it might be his only chance. They gave him a gown and gloves and he went and met his daughter. She was so tiny. She had ten fingers and ten toes. All the parts were there. Dr. Wiringa told him to hold her hand. She was 13 inches long and weighed one pound-nine ounces. They wheeled her in to the NICU while I recovered. Brian sent a text to almost everyone we knew and asked them to pray. When I woke up they wheeled my bed into the NICU where I got to hold Nora’s tiny hand. It was such a mix of emotions. I had always wanted so badly to be a mom but I was terrified of what laid ahead. They told us it was an infection that caused her to be born early. I think on the third or fourth day in the hospital we decided to name her Nora Gayle. We remember feeling that it was so unfair that we had to go through this and that Nora had to fight so hard and might never have a normal life….I mean, I thought had done everything right with my pregnancy. Nora was very small and very sick. We visited every day after work, unless we were sick, and the NICU became our home away from home. We became so familiar with the sounds and smells of the place. We would call every day from work to check in and see how she was doing. It was so frustrating as one thing after another seemed to hold her back and so scary when she would get tested for cerebral hemorrhaging or would have to have her ventilator or oxygen turned up. She also acquired many infections. She was on ventilator for eight weeks. We didn’t even get to hold her until she was four weeks old. That was a great day. Her nurse, Jamie, saved her bath until we got there so we could hold her. It was unbelievable holding her for the first time. Brian took all kinds of pictures. Once Nora was finally off the ventilator we were able to hear her cry for the first time and hold her everyday. We started doing Kangaroo Care where we would hold her skin to skin. This was a wonderful bonding experience. The weeks turned to months and Nora slowly improved. Nora finally came home February 24, 2009, over five months after she was born. When we finally took her home it was just surreal. We were so happy to bring her home but also kind of sad to say goodbye to the nurses, doctors and staff at the NICU who had done so much for us and for Nora. We had really grown to care about them. Nora came home on oxygen and had a feeding tube and an apnea monitor. She also had some hernias that would need to be operated on. It was a lot of work at first but eventually life became more and more normal. Nora is now a normal, healthy two-year-old. Her lungs are still a little fragile and colds hit her especially hard, but all things considered, she’s an absolute miracle…one that we thank God for every single day. 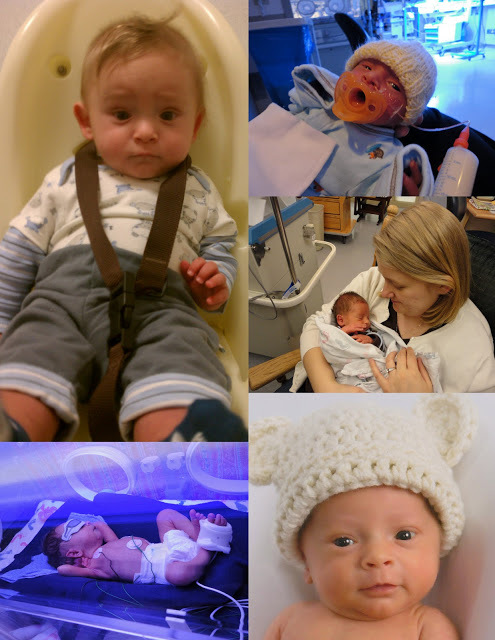 Time for our monthly feature of a family who has endured a NICU stay with their baby. Juanita and Nathan are kind enough to share the story of their son, Alexander. When I went into labor at 32 weeks, I was terrified. 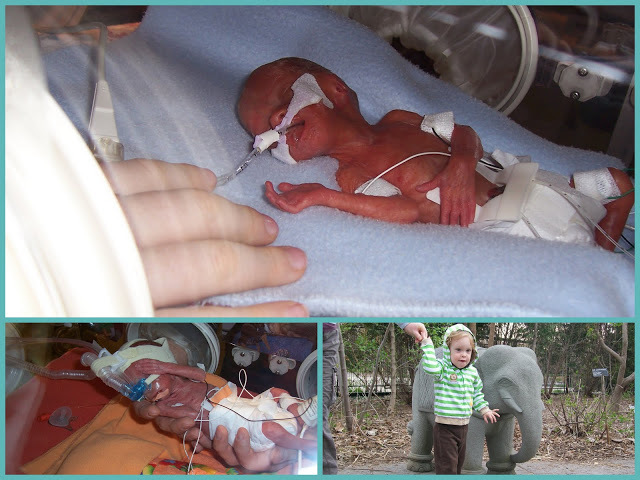 My previous son was born at 35 weeks, and everyone told me how lucky I was that he didn’t need to stay in the NICU. Unfortunately, his first year was a huge battle with breathing, eating, and eczema, and I didn’t want to repeat that battle. And the specter of the NICU loomed over this new son of ours. After a traumatic cesarean delivery, Alexander was whisked away to the NICU while I went to the recovery room under general anesthesia. When I came out from under the anesthesia, I didn’t know how he was doing; I hadn’t even seen him yet. After what felt like forever, I was wheeled up to the seventh floor to see my baby. And he was beautiful, all three pounds and seventeen inches of him. Of course, he was in the isolette, hooked up to all kinds of monitors, IVs, and a CPAP machine that was delivering a low dose of oxygen. His arms were the size of my middle finger, and his head was smaller than my palm. That little miracle baby was mine. While I was in the hospital for my own recovery, I was frequently in trouble with the nurses. My room was on the sixth floor, and Alexander’s was on the seventh, and I am still not sure why they thought I would leave him up there and stay in my bed. Of course, I spent as much time as I possibly could sitting next to the isolette, changing diapers, listening to rounds, and, of course, pumping breast milk for his feedings. Despite the fact that I could not hold my son for the first three days of his life, I wanted to be at his side as much as possible. Because a baby born at 32 weeks hasn’t developed the sucking mechanism necessary for nursing, NICU moms have to pump breast milk that is then frozen in the hospital and used for future feedings. In fact, Alexander was initially given a substance called TPN, a mixture of proteins, carbohydrates, and lipids, through an IV because he couldn’t tolerate breast milk. It wasn’t until he was four days old that he started keeping his gavage feedings down. Gavage feeding is a little tube placed down the baby’s throat, and food is pushed down with a syringe. For three weeks, I was obsessed with how many milliliters of milk he was receiving and keeping down at each feeding. All of the information I needed about Alexander—his weight, his temperature regulation, whether or not he’d had any “spells” of apnea or bradycardia, and his feeding volume—was given to me at morning rounds. The primary neonatologist, a resident, and several interns doing a NICU rotation would all come into the room and discuss Alexander. They would evaluate the data, ask me if I had any questions, and then explain their treatment plan for him. This process helped me piece together a lot of what was going on, and I made it a point never to miss rounds. Aside from morning rounds, the saving grace of Alexander’s time in the NICU was “kangaroo time.” This is time when the baby and parent spend time cuddling skin-to-skin. Studies have shown that kangaroo time helps babies regulate their body temperature and mature faster. Medical studies aside, it provided a healing time for me and Alexander, and I spent each day looking forward to the next time I got to hold my son. Once I was discharged from the hospital, our family got into a rhythm. My husband or mother would drive me to the hospital each morning, so that I could be there for rounds, morning cares, and kangaroo time. I would then go home to prepare lunch for my two other children, put them down for naps, and then do the dinner and bedtime routine. After that, my husband and I would return to the hospital for evening cares. I felt like I had my heart in two places at once, and my body was always in the wrong location. When I was not at the hospital, I worried about Alexander, and when I was at the hospital, I worried about the other two children. While our stay at the NICU was brief, it was a very intense period, and I’m still not able to drive by the hospital and see Alexander’s window on the seventh floor. He just turned one last month, and he is doing better that I could ever have imagined. I am grateful to the doctors and nurses who cared for my son when I couldn’t, and I am so grateful to God for the miracle that is my young Alexander. As a way to increase awareness of what the families we serve go through, we are starting a new monthly feature allowing families who’ve had a NICU stay to share their stories. We hope that eventually these will be families that were able to utilize the NICU care packages that we provide at our local hospitals. I have met many people through Mikayla’s Grace already whose lives were touched by a baby that was born too soon, and thankfully many of them are success stories like the one I want to share today. I met Sarah through Mikayla’s Grace and she donated about thirteen of her son Caleb’s books that will be passed onto other NICU babies. I am so grateful that she is willing to share Caleb’s story with us. Today is a special day for this family as they celebrate the 2 year anniversary of Caleb’s NICU graduation! On May 29th, we will celebrate the 2 year anniversary of our beautiful little boy coming home. However, when Caleb came home on May 29th, 2009 he was already 3 months old; let me start at the beginning. When we found out we were pregnant in September of 2009, we were shocked. I had had severe endometriosis and was told the chances of ever getting pregnant were few and far between. So when that test turned positive, we just knew it was a miracle. We had no idea how right we were. The pregnancy was saddled with problems, almost from the beginning. On February 9th, I was admitted to St Mary’s Hospital in Madison for severe pre-ecclampsia. We were hoping to make it to the middle of April but on February 22, 2009 our miracle who was never suppose to be created was born at 24 weeks due to the fact that my pre-ecclamspia turned to HELLP, which is a deadly turn. Caleb weighed 1 lbs 4.95 oz and was 11.5 inches long. My mother put it best; she said “he weighs as much as a box of butter and he is as long as a foot long hot dog bun with half an inch taken off”. I don’t remember the first 48 hours after Caleb’s birth because I was still fighting for my own life. The first time I finally did see him, I was shocked at what I saw. He was so small; I didn’t even realize that a baby could survive at that age. We were told that Caleb had a long way to go and there was always the possibility he may not survive. My husband and I were convinced our miracle would make it out those doors, eventually. After the “honeymoon” stage however, things began to get rough. They have a saying in the NICU “the life of a preemie is one big roller coaster”. For every 1 step forward we took, Caleb took 6 steps back. He developed a tear in his intestine 2 weeks after he was born. Four weeks after he was born, Caleb suffered a severe bronchial spasm. His lung collapsed and then it spasm shut. He stopped breathing and had no heart rate for almost 15 minutes (of course the nurses were “breathing” for him, but still…). The Dr. said she was going to try one more thing and if that didn’t work, she was going to call it. Well, low and behold, our miracle proved them wrong again. He came back and continued his fight. After that incident, Caleb had a lot of catching up to do. He was placed on steroids 4 times a day for almost 12 weeks, he was given caffeine shots every 12 hours (we had “family coffee breaks” everyday at 3pm), but he slowly began to get better. Over the next few months, Caleb began to gain weight, learned to breathe on his own and figured out that whole “you need to breath while you eat” problem he was having. He still had some issues he had to overcome of course; he had developed retinopathy of prematurity, which meant his retinas were detaching from his eyes. They went in and corrected those and today, there are no problems! He also had double hernia surgery but ironically, once that surgery was done and the pressure was taken off his lungs, Caleb began to breathe 100% on his own. One week after that surgery, we finally were given the OK to go home. When Caleb’s discharge day finally arrived, my husband and I couldn’t believe we were at that point. We never thought we would ever biologically have a child and then, our child was born severely prematurely and shouldn’t have lived. However, as we walked out the doors of the NICU and crossed the sky bridge to the garage, we knew our lives together were finally beginning. We were a family!